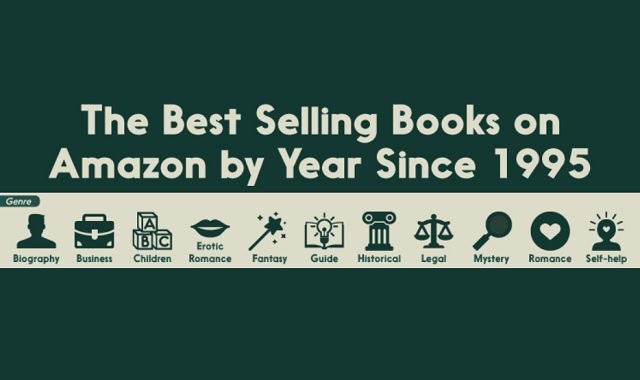 The Best-Selling Books By Year on Amazon #infographic ~ Visualistan '+g+"
Did you know that Amazon got its start as an online bookstore back in 1994? Before becoming the popular online reseller of just about everything that they are today, they used to exclusively sell books. Amazon was the go-to website for pre-orders of any and all popular books that were released, including a favorite amongst many fans – the Harry Potter series. This infographic tells the interesting tale of the rise of the Internet, and the popularity of certain genres of books that grew as it did. From setting up a world wide web site to the biography of Steve Jobs to the business favorite Strengths Finder, this flowchart is a blast from the past! Weave your way through the the story that these best selling books of the past two decades tell and see the struggles, changes, and embracing the new that society went through as the Internet grew in popularity.